Muck in gambling has multiple meanings. In poker, it most often refers to the pile of discarded cards into which players may throw their folded hands, and into which the dealer may place burned cards. It may also refer to the action of throwing a hand into the muck. When a player is folding his hand (face down) without saying anything, in fact the hand is not folded until it reaches the muck (it can be taken back and used if the dealer did not take the hand yet). The practice of mucking cards when discarding helps to ensure that no other player can reliably determine which cards were in the folded hand. 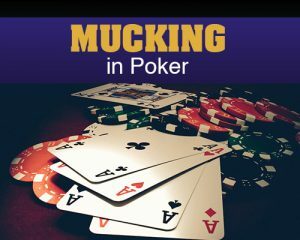 In poker, the term muck may also refer to the action that a player who has not folded may take; he can have his hand “mucked” if another player attempts to discard but one or more cards end up in the live players hand. This is why many players will place a chip or other object on their cards: it helps to prevent errant cards from entering their hand. Sometimes they are referred to as card covers, card guards or card protector. To discard one’s hand without showing it, as allowed when folding, when winning due to all opponents folding, or when beaten by an opponent who revealed cards before you during the showdown. The discard pile, including burn cards, folded cards, fouled cards, and cards discarded in order to draw others. In many poker games, once a card has been discarded, it can not be brought back into play for the remainder of the hand, except under extreme circumstances. This means that discards are considered “dead cards,” and must be treated as such. One of the jobs of the dealer is to collect the dead cards, and keep them in a separate pile, away from the cards in play. This pile of cards is called “the muck.” The “muck” typically consists of all discarded or fouled hands, plus any other dead cards, which typically result from dealer error (for instance, boxed cards, or cards burned and turned too soon.) The dealer keeps this pile of cards face down on the table, either in front of, or to the right of the box. The dealer is expected to do his best to physically protect the muck, to prevent live cards from entering the pile. This is important, because live cards entering, or even touching the muck, may be fouled. Sometimes a player will lose a hand he was going to win, because he has had his hand fouled by the muck. Typically, this happens when a player is not careful about the way he shows down at the end of a hand. In most poker rooms, a hand is not considered a valid shown hand until all cards are placed face up on the table so all can see. If a player turns his cards over incautiously, one or both of them may accidentally touch or land in the muck. This can result in a fouled hand. In addition to preventing live cards from going into the muck, it is also the dealer’s responsibility to prevent dead cards from coming back out of the muck. This is called protecting the muck. Players may wish to remove cards from the muck in an attempt to cheat, either by peeking to see which cards are out of play, or more blatantly, by attempting to incorporate previously mucked cards into their live hands. Although rules vary from poker room to poker room, the muck is often considered a point of no return.